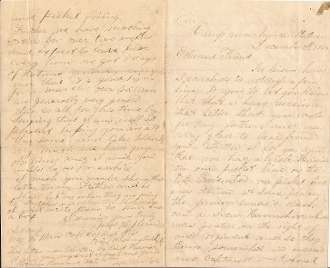 Soldier's Letter, 4 pages, 8vo., Camp near Meades Station (VA), December 8th, 1864. Abraham D. Hendrich (Co. K, 209th Pennsylvania Infantry) writes for fellow soldier William H. Kern, common practice at the time due to high illiteracy amongst the soldiers. "...we had a brisk skirmish on our picket line on the 17th November. Our picket line was driven at some places. The Jonney made a dash on a New Hampshire which was posted on the right of our regiment and so they came somewhat in our rear and captured our Colonel J.B. Kaufman and Captain Lee of Company F the Second Lieut Mr. Hendrick of Company B and twenty three prisoners. I was not out on the line the first night when the firing commenced but the second night. I was on the line and fired twenty two rounds at the Jonney and I hope I have killed or wounded some of the scoundrels. I laid in the rifle pit and pipped away like fury. We left the Army of the James on Thanksgiving morning and took up the line of march and had order to report at Gen. Meade's Headquarters and from there we were send three miles beyond the Weldon Rail Road and there we laid for four days and were doing picket duty but I did like it there. There was cavalry in our advance and we did not see any rebels there. We laid there for few days and then we got orders to pack up and store tents and take the line of march again and marched back about ten miles on the same road which came and here we lay right before Petersburg about 1 1/2 miles from the City. We can see the steeples from our Camp. We have no war news down here no more then what we continually hear day and night that is cannonading and picket firing. Further we have marching order for over two weeks and expect to leave here every hour. We got 5 days of rations...and that is a good sign for a march. Our rations are generally very good..."